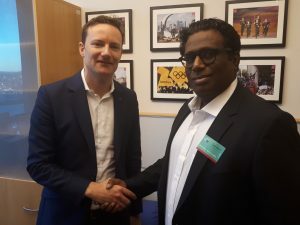 The WSF was honoured to meet today with MEP Seb Dance, who signed our petition for a more active role of the EU in international conflict resolution. We want to thank Mr Dance for his support to our campaign and his work to promote human rights . The Oppression of Free Voices – How can the EU Help to Protect Free Speech in the World?